When I was the Newsletter Editor for the New York Flute Club, I discovered an interest in CD production among the membership. I knew that two of my friends had recently produced CDs, and I had just finished recording Voyage, so I thought a series of articles on this timely topic would be helpful to members of the NYFC who were thinking about recording albums of their own. 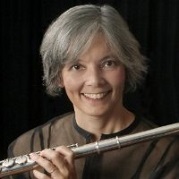 Click on the flutists’ images below for their stories.